Sep 15 Introducing the Wool Wand, a wood tool for stuffing dolls. Like I mentioned this morning in our Stitchy Notes newsletter, the Wool Wand is finally here. A most magical wooden tool for rolling wool and stuffing your natural dolls with. The wool wand is a wooden tool for stuffing your doll with rolled wool. By Fig and Me. Lo and behold, it actually happened. My husband, the resident talented woodworker, has just now created his first set of wooden stuffing tools. He designed these tools for me about 4 or 5 years ago, and when I published this video last year, requests started pouring in about where could people buy this magical tool. We never really envisioned selling the tool, I just wanted to show people how to firmly stuff dolls' limbs, with no bumps or wool cellulite, but of course people needed the actual tool in order to do what I had just shown them. I offered a few replacements for the tool I was using, but I knew that the 'real secret' lied in a strong and sturdy tool that could torque the wool to evenness and a firm state. I felt a little ashamed at not foreseeing this, but fear no longer, you can purchase one as of today!. 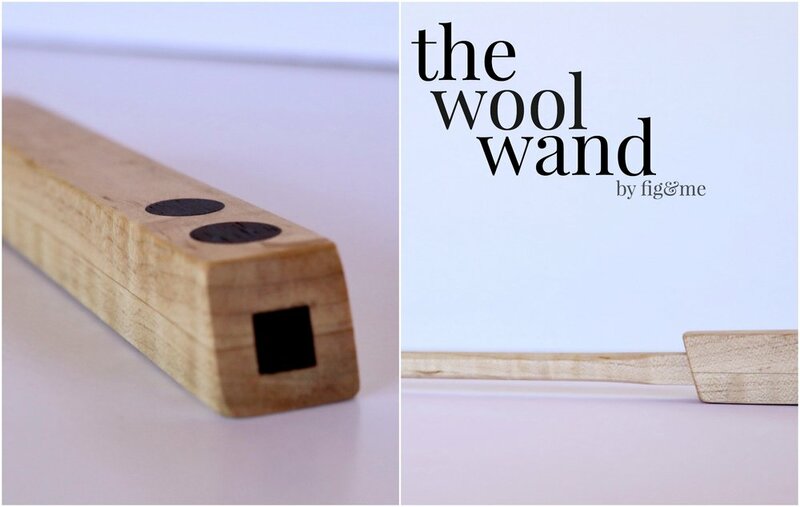 The wool wand is a wooden tool made of beautiful hardwoods, that allows you to roll wood to stuff your dolls. Created by Fig and Me. 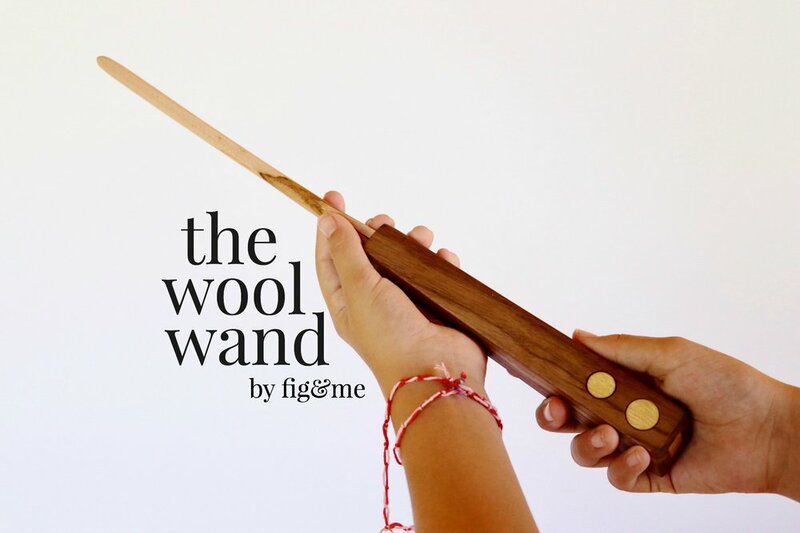 The wool wand, a wooden tool for stuffing dolls with. By Fig and Me. Now, why is this tool superior to the others you find similar in the market? Well, let me tell you!. First, all the other tools have "dowel" for the shank, which is a big issue as you cannot torque wool onto a cylinder, at least not easily and without much time invested. Working with rolls of wool becomes some sort of a necessity when you are trying to stuff firmly and not have wooly cellulite. And when you use wool, you NEED to stuff very firmly because the wool will compact further over time, so you want to get it as firm as humanly possible to begin with. Other tools also have this weird handle shape that places added strain on your hands as you are trying to stuff your dolls. If all you are doing is pushing the wool down, this might not become noticeable at first. But if you are trying to torque the wool into a firm roll, this type of handle makes your hands really tired as you have to work harder. Our tool has a beautifully designed handle, that allows you to turn the tool with minimal strain on your hands (I should know, I use mine all the time and we went through several different handles before I settled onto this one!). Derek went above and beyond for you though. The handles of these beauties have inlaid exotic hardwoods to add interest and beauty to your dollmaking. Nothing but the best from this guy. Most tools are cheaply created with soft woods, and with time and use they become dented, misshapen and yes, they break very easily. So the few dollars you spent on the tool are all but gone now, you need to buy another one. I went through quite a few of these cheap tools, until in total frustration I asked Derek to design something for me, something that would not become twisted after 20 dolls, and that would allow me to torque wool for long legs and arms. This was his answer. He used purple heart and walnut for mine, and has used beautiful hardwoods and even some exotics for yours. We both believe you need the tool to be made out of the best materials, with the utmost care, so that they truly become part of your dollmaking tool repertoire for many, many years, and not just for the current one. As with creating the actual dolls, investing in the right materials produces a higher-quality product. Spending 15 to 40 hours on a doll, using subpar materials is a waste of time and effort. The same goes for your tools. Invest in the right ones, that will serve you well and the investment will be worth it. Beautiful Padauk inlaid details on your wooden tool for stuffing dolls, via Fig and Me. And lastly, why should our tools not be imbued with beauty? Why should we use crappy tools made out of pine, roughly sanded, with weird metal rings that are just there to obscure the rough joins and the glue used?. I actually got one once that had hot glue!. Shouldn't we surround ourselves with beauty as we work too? Granted, tools must perform their duty, they are created for a purpose. They need to perform. But once that aspect is taken care of, why not make them beautiful?. After all, we are artists, creating one of a kind dolls. We are putting our passion, ideas, creativity and love into what we do. I say we deserve something pretty in return. We deserve to work with beautiful fabrics, springy yarns, and beautiful tools to make our dolls come alive. In that regard, this tool is unrivalled. I have never seen anything like it. You will not find a sturdier, more beautiful thing to hold in your hands while you are stuffing dolls. And let me reiterate, if you are not the "rolling wool" kind, this tool is also exceptional to push wool down and stuff your dolls with that method as well. No need to take sides here. Handle it well and it will always be with you. Isn't that the same philosophy we strive to inspire around taking care of the dolls we create?. I feel like I am coming full circle here. I could go and on, but I think you get the point. This is the first 'batch' Derek makes, and knowing him, he might change things a little here or little there (like me, he seems unable to make the same thing twice!). If you are after a particular length for the shank, drop us a note and perhaps he can make you a custom one. Especially if you need a very small one for tiny dolls. We have updated the store with four different designs, so you can choose the one that makes your heart tingle (or goes best with the studio decor! hehe). We really, really hope you LOVE using yours. We hope you become best friends. We hope you can give us any feedback you may have. But above all, we hope you make lots and lots of dolls with it. That's its purpose. And yes, there were two just too beautiful to part with, they are MINE. No shame. Im spoiled and we all know it. Sep 3 Rayne, the woodcutter's daughter.